Is Living in a St. Louis Condo Right For You? High-Rise Condominiums offer an exciting lifestyle, including luxury amenities not available in most single-family homes. At the same time a high-rise condo doesn’t require many of the typical maintenance and chores that come along with a standard home. Sounds like a win-win, right? But is it really the right choice for YOUR lifestyle? Here are a few pros and cons to consider when deciding if living in a high-rise is right for you. For a personal consultation please contact us – we would be glad to discuss your individual situation. Storage: Are you a packrat? Is your garage filled with items from the 70’s that you just can’t part with? Keep in mind that space is at a premium in high-rise condos. In fact your monthly HOA dues will most likely be based on the square footage of your condo, so do you really want to be paying a monthly fee for space that’s just collecting junk? This could be a PRO as easily as a CON for high-rise living. There is a freedom that comes with simplifying and getting rid of baggage, and nothing will expedite that process like moving into a high-rise condo! Most buildings have some sort of extra storage available for a price, or there may be one already paid for and included with some units. Be sure to ask about this when looking. Pets: Many buildings allow common domestic pets with some size restrictions, but nothing exotic (you don’t really want a python loose in a 50-story tower). If you’re “pet-averse” you shouldn’t have a hard time finding a building that is pet-free, or at least large-dog-free. If you have a dog, be sure that the building has adequate green space nearby. It may seem like three or four blocks to the nearest lawn isn’t far right now (hey the walk is good for me, right? ), but may seem like miles on a cold, rainy January morning. Noise: A condo tower is a community, and therefore it has rules which govern the community to keep everyone happy. One of those strictest rules is typically noise control. Most condo buildings have a “quiet period” from mid-evening to early morning during which residents must keep the noise down. Consider your personal schedule - do you work late and then like to listen to music to unwind? Do you sleep days and work nights? This could be a problem as most construction takes place during weekdays and sometimes can be heard throughout the building. Home theaters are very popular now too, so if you just spend $30,000 on the latest and greatest you may want to keep it on the ground (or buy headphones). HOA Dues: This is a common point of contention for high-rise buyers. The dues are paid monthly to the association to cover the upkeep, staff payroll, insurance, reserves and repairs for the building. These fees will vary greatly depending on factors such as the age of the building, the number of residents to share the costs, what’s included in the charge (some buildings include electricity), and the luxury amenities offered. Before you let HOA dues keep you from buying a high-rise, do an “apples to apples” comparison with your current expenses. For instance, if you’re in a home now and considering a high-rise, calculate what you spend each month on insurance, maintenance, repairs, lawn care, pool care, trash pickup, utilities (if included), gym membership, etc. That should give you a better understanding of how HOA dues may replace, and not add to, your current expenses. Lease Units: There are more restrictions around leasing out your unit in a high-rise than there are with a typical home. Some buildings forbid lease units, some limit them, and others may require that a potential tenant be approved by the condo board. Be sure you know the building’s policies before you move in and find out that you’re not able to lease your condo out should you need to. Amenities: One of the great benefits of high-rise living is use of the buildings common amenities. These can range from typical pool and workout room to 24-hour valet, wine cellars and roof-top club rooms. Of course the more extravagant amenities typically come with higher HOA dues. Tell your agent up front what’s important to you so that you can concentrate on relevant buildings where you’ll have exactly what’s right for you. Parking: Most condos will come with assigned parking in a common garage. How many spaces are included depends on how many the original (or subsequent) owner purchased with the unit. The number of spaces has a great impact on the value of the condo, for instance a one-bedroom condo with two parking spaces in a busy district would be a great find. Some buildings will allow you to purchase or lease an additional space – ask the manager for more info. Also be sure the building has adequate visitor parking for your needs. If your friends have to hunt for a spot and feed a meter they may not want to visit as often (which could be a PRO or a CON). Renovations: Are you hoping to find a condo that needs a renovation? Are you a “do-it-yourselfer?” If so you could save time, money and heartache by sitting down the building’s manager for a frank discussion about your intentions. Some buildings only allow repairs by licensed contractors (remember this is a community and your poor repairs could affect other people). Most buildings restrict the hours allowed for repairs to weekdays only, with no work allowed in the evenings or on weekends. So if you work normal hours when would you do the renovations? Reserve Funds: It’s important to find out what’s going on with the building association. Are the owners selling because they know of an impending special assessment? Is the association’s reserve fund adequate? Each building holds regular board meetings in which financial, maintenance and legal issues are discussed and acted upon. Review the minutes from the meetings over the past year to see if there have been any recurring issues that don’t seem to be cured (such as security breaches, leak roofs, plumbing issues, etc.). 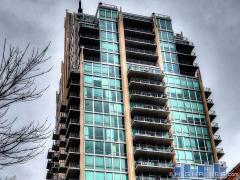 The best way to find out if High-Rise Condos are right for you is to contact us to discuss your personal needs. We can help you become better educated about what’s available in your market, and can take you on a personal tour of buildings that meet your needs.